I hope this note finds you well and enjoying the springtime weather. Sunday promises to be a very good day here at Peachtree Road. In worship, we will continue with our series of messages around the theme “Faithful.” Each week we have been thinking about a different challenge to living an abundant life. Two weeks ago, we considered what to do when “the wrong seems so strong.” Last week, we reflected upon what it’s like when others disappoint us. And this week, we will wrestle with what to do when the past paralyzes you. You know how it is. Something traumatic happens in your life, and you feel like you can’t get beyond it – whatever “it” is. There is a powerful force available that can enable us to move forward with our lives. It is that force that I want us to talk about in worship this week. I hope to see you here. Passion of the Christ: the Musical Stations of the Cross – this moving service features organ improvisations and literature that reflect on the settings and readings of the passion narrative in scripture. The sanctuary will be aglow in candlelight, and you are invited to enjoy the music and allow it to inspire you as you consider Christ’s suffering and death on the cross. The service begins at 7:00 pm. Open Door Listening Sessions – you are invited to participate in one of the six listening sessions we are holding over the course of the weeks leading up to Easter as we consider strengthening the hospitality ministry of Peachtree Road. We encourage you to share your stories, ideas, and hopes with others from throughout our church. We have a limited number of spaces each evening, so please follow this link to sign up today. I look forward to these times with you. Stations of the Cross – if you are looking for a way to take a brief retreat from the noise and busy-ness of your life during this Lenten season, I encourage you to take advantage of the “Stations of the Cross.” You will find a series of paintings and devotionals on the walls of the second floor in the Rollins Building. The paintings depict successive events on Jesus’ journey from his condemnation to his crucifixion, death, and burial. On Wednesday, April 17, at 11:30 am, several of our ministers will guide participants in devotion and prayer and lead them to the next station. The final stations will be positioned in the narthex, and participants then are invited to the midday Holy Week service. I invite you to come by any day of the week to walk the stations with Christ. You may bring your family or a friend to experience the blessing of this journey with you. 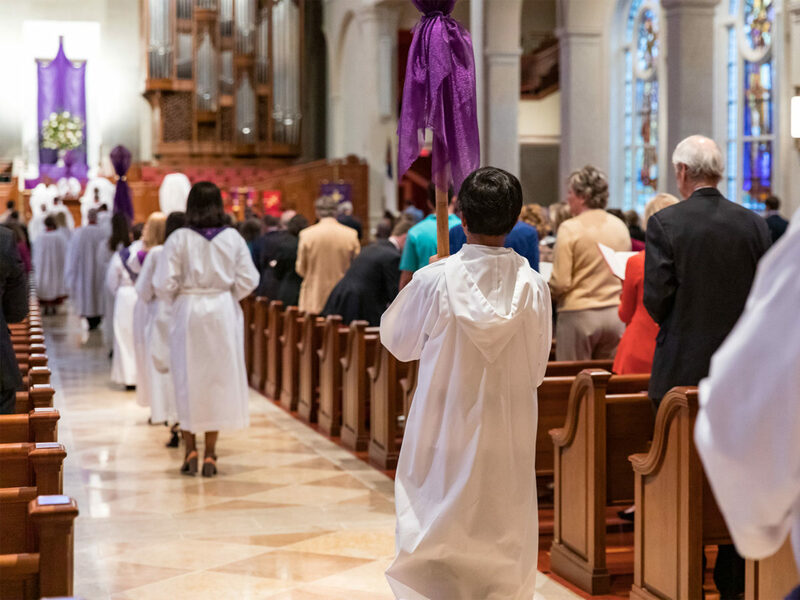 As we head toward Holy Week and our celebration of Easter, I hope you are planning to participate in this year’s Lenten Offering. During this season we set aside funds to support our partners in ministry throughout Atlanta. Last week we heard about our church’s Restoration Prison Ministry and the difference it makes in the lives of others. Each of us is challenged to take the money we would have spent on that which you have “given up for Lent” and give it toward the Lenten offering. If every member of Peachtree Road gives at least $1.50 a day for 40 days ($60 total) toward the offering, we will reach our goal. Your sacrifice will change your life for the better, and your gift will change Atlanta for the better! You may start giving now through the church app or online here. As we journey through Lent toward Jerusalem and the cross, do you wonder what it would be like to visit the Holy Land and see the land of the Bible? If so, I would like to invite you to take the next step and consider travel with your friends from Peachtree Road on a spiritual pilgrimage to the Israel with an extension to Egypt. On February 15-26, 2020, Jamie Jenkins and I will be taking a group from the church to walk in the footsteps of Jesus. Imagine the thrill of seeing with your own eyes the town of Bethlehem where Jesus was born… the upper room where Jesus washed the feet of his disciples… the hill in Jerusalem where Christ died for us… and the place where God raised him from the dead. We would love to have you join us. For more information, contact Jamie Jenkins at 404.771.7031 or jamiej@prumc.org. Now is the best time to sign up! Finally, do you know someone who is looking for a church home? Peachtree Road is a wonderful place, and our gatherings on Sunday morning very much have the feel of a family reunion. Maybe you know someone who is in need of an extended family of faith to help support them, nurture them, and help them know the fullness of God’s love and grace. Why not invite them to join you here at Peachtree Road? Please contact Mimi Brunson (mimib@prumc.org) to learn more about becoming a member and getting connected. These are great days to be a part of Peachtree Road. I look forward to seeing you Sunday!